Last month’s Wenneker Swizzle Masters victor proved there is more to the classic Bloody Mary cocktail than being a hair-of-the-dog remedy. Securing a place in the semi-final in October was bartender Silvia Piccinato, whose Bloody Mary Twist-themed cocktail Summer Bloody Summer, won over the judges’ approval. Hosted at The Boulogne Bar at The Bull and Gate in Kentish Town, London, the cocktail was recreated by the venue’s assistant manager Fatima Kamil and included Stolichnaya Vodka, fresh tomato juice, Wenneker Crème de Cassis, Wenneker Strawberry, fresh lime, fresh strawberries and brown sugar. Assessing the latest round were Marcin Twardowski, bar manager of The Crazy Coqs, Nuria puertos Ahuir, events coordinator at The Spirits Business, and Kristiane Sherry, editor of The Spirits Business. Twardowski said about the winning creation: “This cocktail has a lovely palate and is very well balanced. Second place was awarded to Enrico Basile for his cocktail Med Mary, which took its inspiration from Mediterranean ingredients such as basil, garlic, rosemary and olives. Third place was awarded to the “simple but delicious” Country Garden by Charlie Gollands, which impressed the panel with tis “long finish” and “delicious aroma”. Piccinato’s recipe will compete in the semi-final in October against either other semi-finalists’ drinks. 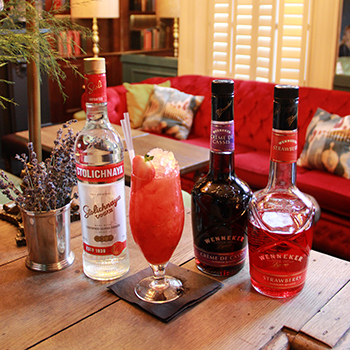 Just five cocktails will then be chosen for the grand final in November, when the winner will be named Wenneker Swizzle Masters 2016 and win a £1,000 prize. The next Wenneker Swizzle Masters round is Italian Apéritif. Entrants are challenged to take inspiration from Italian culture to create a delectable aperitif style cocktail using either Bianco or Rosso Martini vermouth. Bartenders have until 14 April to submit their recipes online at www.swizzlemasters.com.